So its been about a month or so that I got my bike… I finally realized since she’s already been through like 3 marchas, 1 Spokes & Words crew ride and lots of circles around my ‘hood and she should be called LUCHA. She’s black and red como the words and life we live and in honor of the tlamatinimes (http://www.amoxtli.org/cuezali/mono.html). I am really thankful to Christina Torres of the blog City Girl Rides (http://citygirlrides.blogspot.com/) and Erick Huerta of Spokes & Words. They both gave suggestions on where and how to look for a bike that would fit me and Christina has a dope blog about mujeres and biking and her daily adventures, etc. I recommend it fo’sho. I am happy to have my bike LUCHA for a lot of reasons. using it as a tool for education & empowerment = my bumpin’ bici rides especially. I appreciate the crews out there that are getting together and making things happen on the streets, and especially the ones that are thinking of things in a different way. Yes, its dope just to ride as community conscious individuals…but why not bring a little more to it. Ovarian Cycles is a dope crew founded by Xela aka Cihuatl Ce (www.myspace.com/cihuatl1). The group is an all wombyn’s ride that state’s “Come ride off da stress, get a work out, connecting with other wombyn & w/local resources thru da streets of LA.” I’m told they’ve picked sage, and stopped at a community center to learn about what’s around town…but I actually haven’t rolled with them yet…but looking forward to see how it can be empowering and connect more consciousness & ceremony. Bueno I’m glad that Xela and Erick are making things happen! On my own adventure I’ve made a few call outs to veteran activists and organizers and also teatristas and performers/poets to come out and do street stuff. Mainly at organized protests and marches that are already happening. Unfortunately most for lots of reasons haven’t been able to come out. So I’ve had to make it happen on my own… which has been pretty dope. I’ve been rolling around with the Bumping Bici which is my cruiser that has a small battery powered sound system with a mic and mini P.A. Its been really amazing to share your sacred words on sacred land while moving through la madre tierra with ehecatl and tonatiuh at your back sharing words of empowerment. 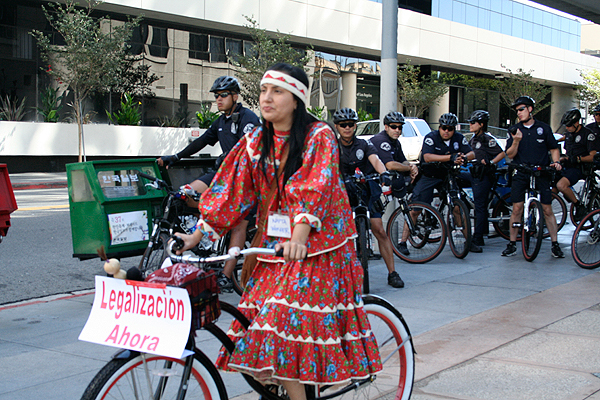 I have been rolling through the streets usually with my raramuri/tarahumara clothing on to represent my raices but also to call attention to the human rights abuses happening all over the world but especially in Mexico to indigenous peoples. 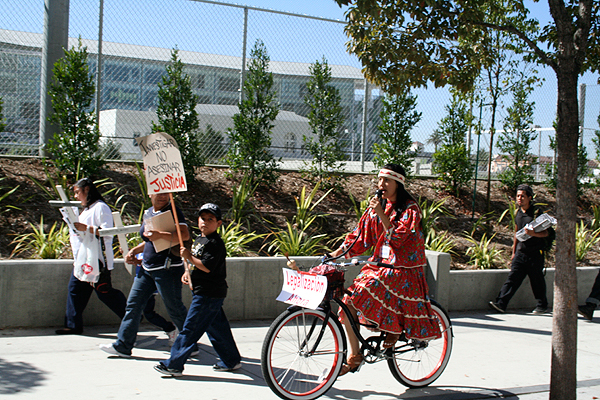 biked to the site of Manuel Jamines killing, burned & left some sage and rode out playing Ricardo Arjona's song "el mojado"
riding in the march for the 72 migrantes massacred along Wilshire in L.A. We hit 3 consulates calling for justice. I also have been riding around my neighborhood and bumpin the bici sound system with politically education and empowering music including my own. I plan to do it on October 12th in the afternoon/evening and am looking for others to participate in a more public ritual/ceremony and performance protest –any one interested in being a part of it please let me know …we also need documenters (photo and video). I also plan to join Nico from Los Poets del Norte in thee street actions on October 16th…more info to come. Bueno, I am excited about the power of getting our cultural gifts and expressions out of the centros and galleries, etc and into the streets. Its time to connect with new audiences and not preach to the choir as they say. That’s where I feel I’m at and although I love doing community cultural events I feel a HUGE urgency to move it to other locations and other communities and in different ways then what most of our circles have been doing. or for the ceremonial sisters and “RBG” (revolutionary but gangsta but I’d say revolutionary bike grrrls) this one…. In night rides, don’t forget to wear them…whether its cool or not your life is a blessing and all of us are too precious to many people to not wear it! I look forward to the many adventures to come. felicia, i’m happy to see how you are using your bici for your amazing work, i’ll continue to spread the word and love that you shine. gracias for sharing mujer, youre inspiring. The bloguerrillera es DOWN! Love ur wordsmithin’ always and proud and happy to find you behind the bici movimiento, carnalilla! so glad to see so many brown and down people blogging about their bike love.